I modified one of my space stations for SE 0.974 RC3. It was something of a major overhaul. Outwardly not much has changed - I've added a spoke (the population has increased) - but internally it is completely rebuilt. The renovation was urgently needed. All segments have lost their orientation. The new version should also work in RC2. 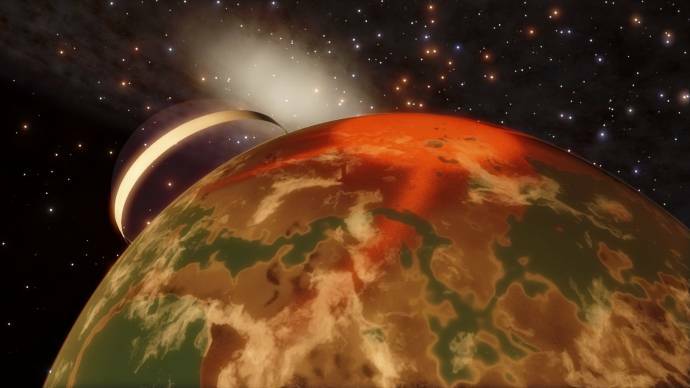 When are you going to add the Ringworld? I'd love to see that. As always with these things, which are not really possible in Space Engine, there are some drawbacks. But otherwise it can look quite interesting. WIth protective shield that prevents you can land at the ring. The name of the star is An'dohan or Haula, and has the number JDV 00042 in my private star catalog, the name of the ring is 'An'dohan Trufainne'! May I ask why nearly everything in this thread is made entirely of spheroids? Perhaps because this is my method to make these things? So far I also have not found a way to create, for example, cubes in Space Engine. Without them to put together. From six flat spheroids. And without using spacecraft models. Somewhere I've read that it is possible. Unfortunately, it was not explained how it is possible. JackDole, Whit kind of scripts do you use to make your structures? I'm interested in trying something of the sort myself, but I'm not sure where to start. Whit kind of scripts do you use to make your structures? I'm interested in trying something of the sort myself, but I'm not sure where to start. It are ordinary scripts for planets or asteroids. WIth 'Oblateness 0.999'you can make a flat disc. With 'Oblateness 0.5', for example, something like an egg. 'DiffmapAlpha "Transp"' makes parts of textures without pixels invisible. The inside of this ring is a 'Clouds' layer. If you by disabling clouds, it disappears. Sample script for the rings. DiffMapAlpha "Transp" // makes parts of textures without pixels invisible. Well, what I was asking about were the loops that you run to calculate and arrange the object's positions and size, and what tools you used to do that. I've created addons of planets and moons by hand, but I'm more interested on how to create them automatically. Thanks for the detailed response though! The amount of effort you put into your posts to make them clear and easy for everyone I find staggering. I certainly would not have the patience to do so myself. Sorry, I have misunderstood that. The scripts were simple MS-DOS scripts. Much like the original version of the script for generating asteroid belts. But some parameters are changed in SpaceEngine, so the scripts and the Dyson bubbles no longer function. After publication of the official new version of SpaceEngine, I might make new scripts for it. I also used a lua script for the calculation of floating point numbers, which was called by this MS-DOS script. Any other calulator which can output results in the console can also be used for it. But I have here a script that can generate a Dyson ring for our sun. The ring works with SE 0.974 RC3. If the parameters are adjusted in the script, you can of course also produce rings for other objects. The lua script is also included, but that only works if you have installed Lua. Your stuff is great. Can't wait for the Wanderer and Callisto Base. JackDole, you should give star lifting a go as your next megastructure, would be interesting to see your take on it. Maybe I can do something. But I have to think about it. The rings around the Callisto Base are disabled. Those who would like these rings, can use the script CBaseRing.sc. Put it in 'addons\catalogs\planets'. Because it also gives the asteroid Europa, I had to take the moon Europa in the script, and give him the additional name 'Jupiter II'. As 'ParentBody' for the station. And to avoid future conflicts, I have made this also with the Calisto base. This 'city' is, however, currently totally wrecked.